Unique and beautiful Yogi! Thanks so much for joining us at The Sisterhood’s ‘RED’ challenge and please come back again soon! Your beautiful woven background looks amazing with these fabulous dies. Thanks for playing along with us at fab n Funky this week. What a cool woven background! And you're right, those dies are fabulous! Love the elegant font. Thanks for playing with The House That Stamps Built and LTSCB. Fantastic woven background! Thanks for entering our ATG challenge at TTCRD. Looking forward to see you again next challenge and good luck. Wow I do love your weaving and your creativity such pretty colours and card. 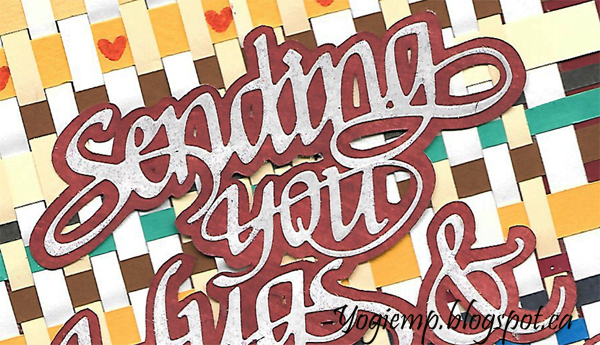 Thanks so much for sharing it with us over at Penny Paper-Crafting Challenge and good luck. Very pretty card. I have never seen the woven background technique. Great idea. Thanks for joining the Sisterhood's "Red" challenge. Oh how pretty - love all elements of this card - especially the woven background. Thank you for joining us at The House that Stamps Built this week. That background is awesome! Thanks for playing along with us at The House That Stamps Built. Look at all that weaving! Very detailed and makes an amazing background! This is terrific and so unique! Thanks so much for playing along at CCCB!! Lovely card, great colours, thanks for sharing at Fab'n'Funky this week. Thank you for linking up this beauty with Scrapy Land challenge! Very pretty! So creative and a fun idea. Thanks for joining us at Dies R Us! Spot on our theme; it;s gorgeous! Thanks so much for joining us at CCCB! That weave must have taken ages to do. How clever. Very out of the square thinking. Very cool weaving in the background with a lovely sentiment. Beautiful! Thanks for playing along with us at Frilly and Funkie "Be My Valentine" challenge. What a fun card.......great way to use scraps. The dies are the best way to make the work POP! Great job. Fabulous card! Thank you for joining us at Love To Scrap Challenge Blog! This is gorgeous, Yogi! You must have the patience of a saint. I tried doing a woven card once and gave up in total frustration. I am beyond impressed with your beautiful creation. Thank you so much for joining us at the Frilly and Funkie Challenge! Lovely card. Thank you for joining the challenge at Whoopsi Daisy. Unfortunately the rules say that you must use a digital image or something from a CD. Gorgeous card. 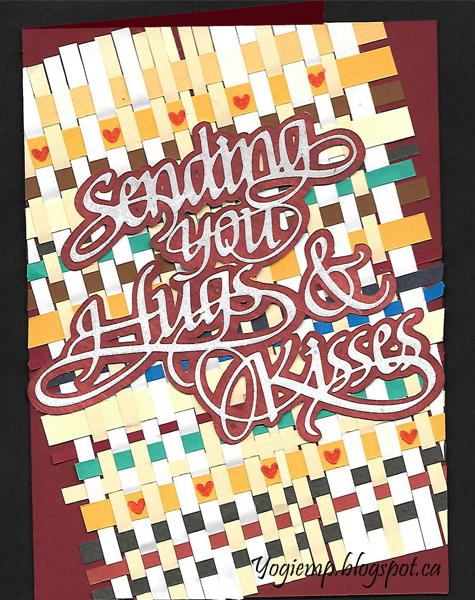 Thanks for joining in this months 'Love is in the Air' challenge over at Crafty Calendar. Beautiful card. I love the background. Must've taken a long time to make it, but absolutely worth it! Thanks for sharing at Simply Create Too and hope to see you again. Good luck.